The Trans-Caspian railway finally reached Bukhara in 1888. The Emir had been suspicious, and viewed trains as the 'Devil's wagons'. To cross his territory, he demanded just recompense be paid in German silver shipped all the way from Hamburg and an assurance that the railway would not pass within ten miles of the holy city. So the Russians built a new railway settlement outside in nearby Kagan. At the same time the so-called 'Political Agency', a special organization for diplomatic affairs between the Russian Empire and the Bukhara Emirate, was also located in Kagan. It is said that within a few years, Bukharans were squatting in railway carriages for hours waiting for the remarkable sensation of locomotion and that the Emir could be found riding in a mock carriage in his summer palace as servants fluttered bits of coloured paper outside the window to give the impression of speed! Today, a railway modernization project is making Uzbekistan a regional leader in rail transport. With railways the primary mode of transportation, a better railway system boosts internal trade by cutting travel and business costs. And it is great for tourists. The first of two Talgo 250 trains travelled from Spain via Saint Petersburg and arrived in Tashkent on 22 July. The second train is due to be delivered in September. The trains are set to cut journey times on the 344 km Tashkent - Samarkand route from 3½ to 2 hours. Later the service will be expanded to Bukhara and Khiva. The schedule has not yet been announced. Hopefully on Uzbek Journeys tours we will be able to ride the new trains. If not, we will travel on the excellent air-conditioned express 'Registan'. Either journey is better than the 5.5 hour bus trip and maximises time in Samarkand. 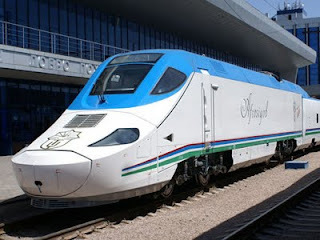 Update June 2012: The Talgo 'Afrosiabs' operates daily from Tashkent to Samarkand, departing Tashkent at 8:00 a.m. and arriving Samarkand at 10:30 a.m. It is an outstanding service, with a light breakfast sandwich and green tea served as breakfast. Good espresso coffee is available for 4,000 soums.